The changing role of IT Support in businesses has made it imperative for IT service desk software to break away from the shackles of traditional IT service management. With trends like increasing complexity of IT systems, advanced technologies on multiple service delivery platforms and an untethered mobile workforce to cater to, IT help desks need to gear up to address the challenges of the new age. 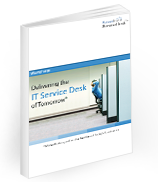 This whitepaper examines the pitfalls of traditional IT service management and offers a perspective on why on demand IT helpdesks on the cloud may just be the answer in the future. Download the white paper for free now!! !